Removals, Storage, Man and Van Hire and House Clearance in East London and E London. Allen & Young Removals and Storage are pleased to be able to offer the full range of our Removals, Packing, Man and Van Hire, Storage, House Clearance and a range of Business Moving Services to most East London Districts and many of the following postcodes: E1, E2, E3, E4, E5, E6, E7, E8, E9, E10, E11, E12, E13, E14, E15, E16, E17, E18 and E20. About South East London, SW London. The E (Eastern) postcode area, also known as the London E postcode area, is the part of the London postal district covering much of east London and comprising the postcodes E1, E2, E3, E4, E5, E6, E7, E8, E9, E10, E11, E12, E13, E14, E15, E16, E17, E18 and E20. Allen and Young Ltd carry out all moving services including removals, man and van, storage, packing and house clearance in the East London area. The postcode area covers the London Borough of Tower Hamlets, the London Borough of Waltham Forest and the London Borough of Newham and parts of the London Borough of Hackney and the London Borough of Redbridge. 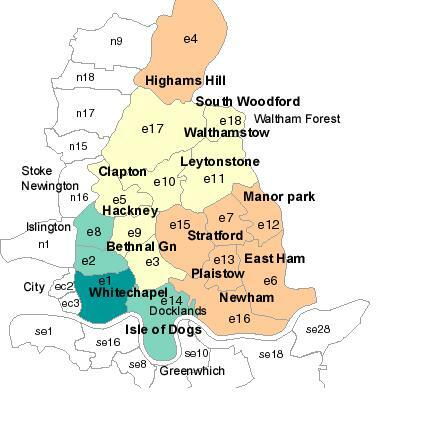 The postcode area does not cover all of East London; the remainder is covered by the RM and IG postcode areas. Some parts of Hackney are in the N postcode area. The E4 postal district uniquely extends beyond the Greater London boundary and covers part of the Epping Forest district of Essex around Sewardstone. The current E postcode area was originally formed in 1866 as a merger of the E and NE areas created in 1858. In 1917 the postal districts were numbered alphabetically by their location, the districts usually cover a wider area than their names might suggest. As of 2004, the district names do not form part of the postal address.